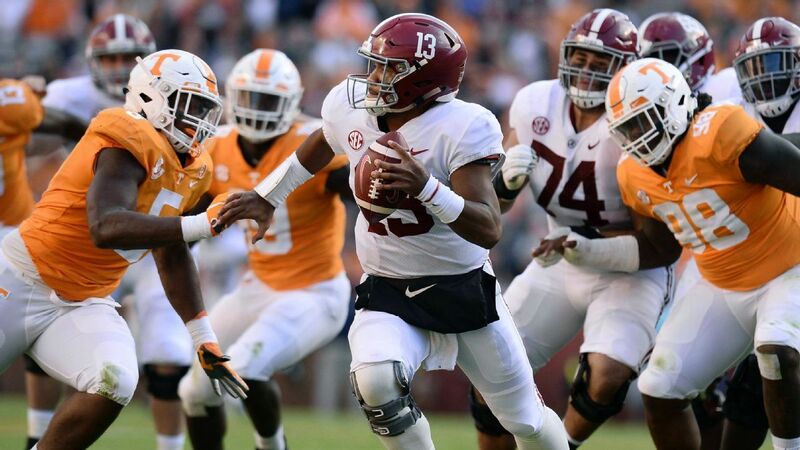 KNOXVILLE, Tennessee – Alabama quarterback Tua Tagovailoa finished the 58-21 win on Saturday against Tennessee at the start of the third quarter after scoring, but coach Nick Saban said Tagovailoa was fine and could have returned to the game again when the No. 1 Crimson Tide needed him. "He's fine and he ran after the game," Saban told ESPN. "We were about to get him out, he had that (stretched right knee) for two weeks, but moved much better this week and it was obvious he had much more confidence in it." Alabama has an open date next week before driving to LSU # 5 on November 3rd. "Tua will be fine and do well for the team because we need to keep improving," Saban said. Tagovailoa threw four touchdown passes while defeating the Vols, the last being a 41-yarder Henry Ruggs III with 12:53 in the third quarter. In this game, Tagovailoa was hit by Tennessee linebacker Daniel Bituli and was slow to get up before jogging to the sideline. "He kicked my leg and my knee just buckled in. That's it, I was fine," said Tagovailoa, who finished 19-of-29 for 306 yards against the Vols and a total of 27 touchdowns and no interceptions this season even though he did not snap in the fourth quarter. Tagovailoa threw touchdown goes to four different players on Saturday, as Alabama's 58 points were the most points against Tennessee from any team in Neyland Stadium history. "Things are so much more fun when you do not just have one person to go when you have guys running back who can play for you as well," Tagovailoa said. "It's just a lot of fun out here."